The new Come Follow Me curriculum is meant for everyone! Sometimes we come across ideas online that would work great for families with young children. We wanted to share with you some ways that you can make the Come Follow Me curriculum work for your older children and help them to develop a closer relationship with our Savior. Click on the image below to download an idea sheet from IvoryBloom to help you navigate this curriculum with your teen. 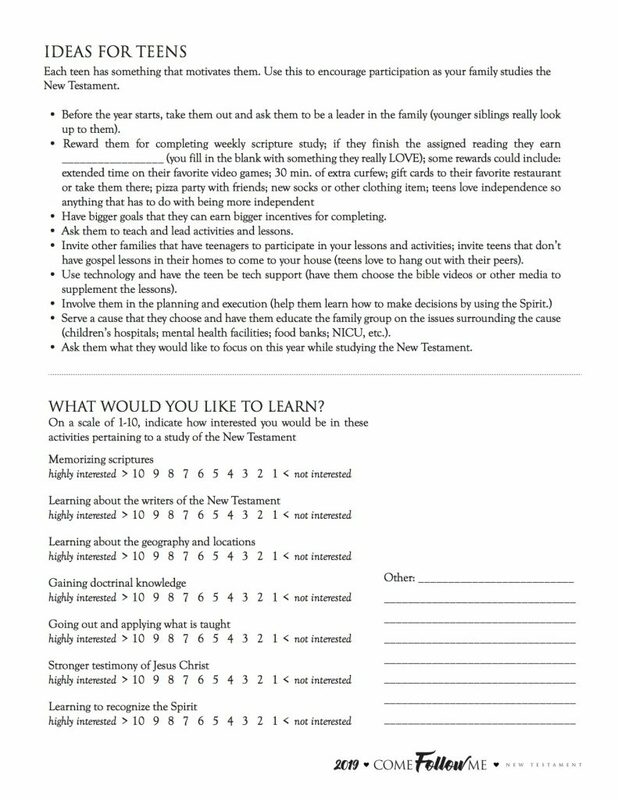 There is a great interest survey on the bottom of this printable to help you understand how to better teach your teen. As always, listen to the Spirit while planning your lessons. Not every child, no matter the age, will learn the same way. God will help guide you as you prepare to teach your family. This entry was posted in church, come follow me, faith & family, fhe, lds and tagged bible, come follow me, new testament, strengthening home and family, teaching your teen, teen on December 7, 2018 by ktoponce.